Although every strange bump from the night is not the result of a bed bug bite, Rose Pest Solutions' board certified entomologist Mark VanderWerp assures that the pest is back and here to stay. But before you go flipping mattresses, learn how to detect bed bugs to determine if you have a problem. Check in the sheets (including under fitted sheets and mattress pads), under the box spring, behind the headboard, and any other porous surfaces in the bedroom or around furniture where people typically sleep (like dad's living room recliner). Mark says the presence of bed bugs will be obvious. "The eggs are awfully small, but by the time these things are adults, they're a good size, close to a quarter of an inch. They can be compared to an apple seed in size and color," he says. There are several kinds of bed bugs including those that specifically target bats, swallows, and poultry. Although these are not likely to pass up a meal, Mark says, they are not as dangerous for humans. Carpet beetles are often mistaken for bed bugs, but they do not typically bite the human body like bed bugs. They feed on dead skin and hair, Mark says. "They're not there to bite you, they're there to bite the old you." If you find a bug, don't throw it away, especially if you're unsure of its species. Bring the dead pest to a professional who can diagnose your home's situation. Because bedding is often changed in hotels, bed bugs do not typically live within the sheets like they can at home, but do check behind the headboard and under the box springs of the mattress. Mark recommends packing a small flashlight in your suitcase and checking these places before you settle in for the night. If you do find bed bugs, the best thing to do is call in the professionals. Because there is no cure-all pesticide for eradicating bed bugs, home owners who tackle the task themselves will have to be thorough and in for the long haul. 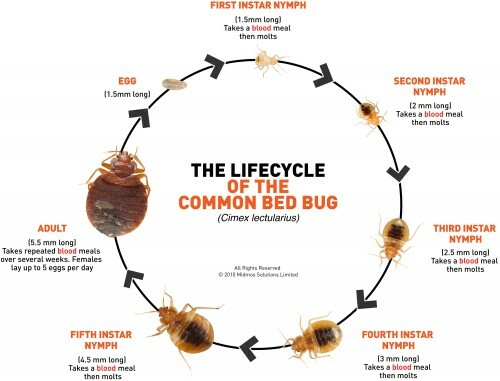 Residual pesticides placed in rooms or traps for long periods of time have no effect on bed bugs. It is only possible to kill bed bugs by hitting them directly with any sort of bed bug killing chemical–although the science of bed bug pesticides is still evolving. Extreme heat also wipes out the bug. "Think of it more as a room remodel than ant bait," Mark says. "Go through everything, flip over the mattresses, find all the places the bugs could be." If bugs are eradicated from the bed, Mark recommends bed bug traps on the legs of furniture. These will prevent bed bugs from crawling up the furniture and into the sheets, and help reduce the population. Vigilance, says Mark, is the best remedy. To view the article as it appeared in West Michigan Woman Magazine, click here.